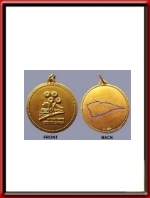 1954 Gold Medal, Syracuse Grand Prix, awarded to Mike Hawthorn. This medal was given to Mike Hawthorn for competing in the 1954 Syracuse Grand Prix. 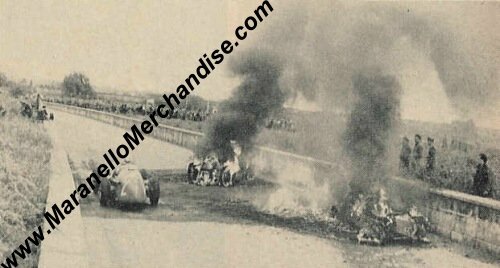 Mike drove a Ferrari 625 in this Grand Prix which he crashed and he sustained serious burns to his arms and legs in this accident. "....Marimon in a Maserati drove too close to the right side of the track and sent up a shower of hay. Blinded by the flying chaff, the second place car, a Ferrari with Hawthorn driving, crashed against the safety wall and the car caught fire. Gonzales, about seven feet behind Hawthorn, piled into the Englishman's car, careened and went into the wall. Both cars were destroyed by the flames and Hawthorn was taken to the hospital....". Shown below is a photo from R&T of the scene of the accident. This medal went straight from Mike's estate, in 1959, to an important collector from whom we acquired it recently. 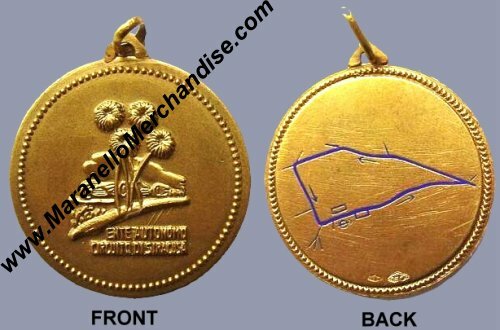 Measures approximately 1.25 inches in diameter and is made of 18 carat gold.